Rosita Worl, whose Tlingit names are Yeidiklasókw and Kaaháni, is Tlingit, Ch’áak’ (Eagle) moiety of the Shangukeidí­ (Thunderbird) Clan from the Kawdliyaayi Hít (House Lowered From the Sun) in Klukwan. 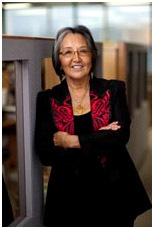 Yeidiklatsókw serves as the President of Sealaska Heritage Institute. She is an anthropologist and for many years served as Assistant Professor of Anthropology at the University of Alaska Southeast. Yeidiklatsókw has a Ph.D. and a M.S. in Anthropology from Harvard University, and a B.A. from Alaska Methodist University. She also holds an honorary doctor of sciences degree from the University of Alaska Anchorage. Dr. Worl has received many honors and works with several different Native organizations. She is an accomplished lecturer and author.